Jane Morris (née Jane Burden; 19 October 1839 – 26 January 1914) was an embroiderer and English artists' model who embodied the Pre-Raphaelite ideal of beauty. 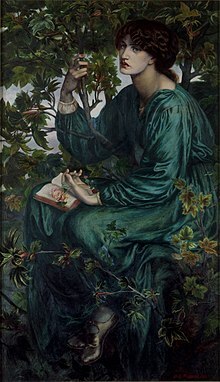 She was a model and muse to William Morris (1834–1896), the English textile designer, poet, novelist, translator, and socialist activist, whom she later married, and to Dante Gabriel Rossetti. Jane Burden was born in Oxford, the daughter of a stableman, Robert Burden, and his wife Ann Maizey, who was a laundress. At the time of her birth, her parents were living at St Helen's Passage, in the parish of St Peter-in-the-East, off Holywell Street in Oxford which has since been marked with a blue plaque. Her mother Ann was illiterate and probably came to Oxford as a domestic servant. Little is known of Jane Burden's childhood, but it was poor and deprived. In October 1857, Burden and her sister Elizabeth, known as Bessie, attended a performance of the Drury Lane Theatre Company in Oxford. Jane Burden was noticed by Dante Gabriel Rossetti and Edward Burne-Jones who were members of a group of artists painting the Oxford Union murals, based on Arthurian tales. Struck by her beauty, they asked her to model for them. 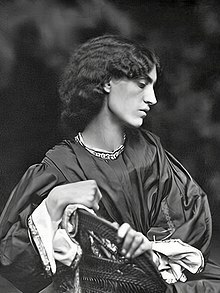 Burden sat mostly for Rossetti as a model for Queen Guinevere and afterwards for William Morris, who was working on an easel painting, La Belle Iseult, now in the Tate Gallery. During this period, Morris fell in love with Burden and they became engaged, though by her own admission she was not in love with Morris. Burden's education was limited and she was probably destined to go into domestic service like her mother. After her engagement, she was privately educated to become a gentleman's wife. Her keen intelligence allowed her to recreate herself. She was a voracious reader who became proficient in French and Italian, and she became an accomplished pianist with a strong background in classical music. Her manners and speech became refined to an extent that contemporaries referred to her as "queenly." Later in life, she had no trouble moving in upper-class circles. She was possibly the model for the heroine of the 1884 novel Miss Brown by Vernon Lee upon which George Bernard Shaw based the character of Eliza Doolittle in his play Pygmalion (1914) and the later film My Fair Lady (1964). She also became a skilled needlewoman and later became renowned for her embroideries. Jane married William Morris at St Michael at the Northgate in Oxford on 26 April 1859. Her father was described as a groom, in stables at 65 Holywell Street. After the marriage, the Morrises lived at Red House in Bexleyheath, Kent. While living there, they had two daughters, Jane Alice "Jenny," born in January 1861, and Mary "May" (March 1862–1938), who later edited her father's works. They moved to 26 Queen Square in London, which they shared with the design firm of Morris, Marshall, Faulkner & Co., and later bought Kelmscott House in Hammersmith as their main residence. In 1871, Morris and Rossetti took out a joint tenancy on Kelmscott Manor on the Gloucestershire–Oxfordshire–Wiltshire borders. William Morris went to Iceland, leaving his wife and Rossetti to furnish the house and spend the summer there. Jane Morris had become closely attached to Rossetti and became a favourite muse of his. Their relationship is reputed to have started in 1865 and lasted, on differing levels, until his death in 1882. They shared a deep emotional relationship, and she inspired Rossetti to write poetry and create some of his best paintings. Her discovery of his dependence on the drug, chloral hydrate, which was taken for insomnia, eventually led her to distance herself from him, although they stayed in touch until he died in 1882. In 1884, Jane Morris met the poet and political activist Wilfrid Scawen Blunt at a house party given by her close friend, Rosalind Howard (later Countess of Carlisle). There appears to have been an immediate attraction between them. By 1887 at the latest, they had become lovers. Their sexual relationship continued until 1894 and they remained close friends until his death. Jane Morris was an ardent supporter of Irish Home Rule. A few months before her death, she bought Kelmscott Manor to secure it for her daughters' future. However, she did not return to the house after having purchased it. Jane Morris died on 26 January 1914, while staying at 5 Brock Street in Bath. She is buried in the churchyard of St. George's Church in Kelmscott. The Blue Silk Dress, 1868. Proserpine or Proserpina, 1874. Oil on canvas. Tate Britain gallery, London. Astarte Syriaca, 1875–79. City Art Gallery, Manchester. Beatrice, a Portrait of Jane Morris, 1879. Oil on canvas ​13 1⁄2 × 11 inches. The Day Dream, 1880. Oil on canvas. Victoria and Albert Museum, London. La Donna della Fiamma, 1877. Coloured chalks. Manchester Art Gallery. La Donna della Finestra, 1879. Oil on canvas. Fogg Museum of Art, Harvard University, Cambridge, USA. La Donna Della Finestra, 1881 (unfinished). Jane Morris, c. 1860. Pencil. Mariana, 1870. Aberdeen Art Gallery. La Pia de' Tolomei, 1866–1870. Oil on canvas. Spencer Museum of Art, University of Kansas. Portrait of Mrs William Morris. Portrait of Jane Morris, 1858. Pen. Reverie, 1868. Chalk on paper. Ashmolean Museum, Oxford, UK. Study of Guinevere for Sir Lancelot in the Queen's Chamber, 1857. Photographs of Jane Burden by Rossetti are available at . La Belle Iseult (also called Queen Guinevere), 1858. Oil. Numerous stained-glass windows, including at Christ Church, Oxford. ^ Marsh, Jan (2000). Jane & May Morris: A Biographical Story. Horsham, UK: Printed Word. pp. 5–6. Wikimedia Commons has media related to Jane Morris. Marsh, Jan (1986). Jane and May Morris: A Biographical Story 1839–1938. London: Pandora Press. ISBN 0-86358-026-2. Marsh, Jan (2000). Jane and May Morris: A Biographical Story 1839–1938 ((updated edition, privately published by author) ed.). London: Jan Marsh. Mancoff, Debra N. (2000). Jane Morris: The Pre-Raphaelite Model of Beauty. San Francisco: Pomegranate. ISBN 0-7649-1337-9. This page was last edited on 14 March 2019, at 15:45 (UTC).